New native wines featured now at Windham Wines. Learn how native wines are important. This is consistently our favorite Etna Rosso, a blend of Nerello Mascalese and Nerello Cappuccio from the northern slopes of Etna. The property is buccolic, beautiful, humbling and organically farmed. A 1981 eruption from this active volcano dissected the property, yet vines began to push through the solidified lava in 2014. This is volcanic soil which, in combination with winemaker Chiara Vigo’s spiritual appreciation of the place and its vines, gives us a wine of complexity and elegance. Godello is one of those grapes resurrected from near extinction just twenty-five to thirty years ago. Part of its renaissance includes exploring different styles, from very ripe with malolactic and some oak aging to cleaner, fresher versions. 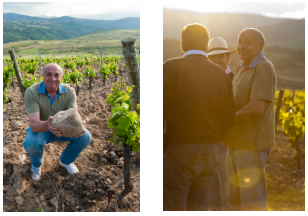 The Papa is in the latter category– pure Godello, just the grape, no malo or oak. The 2016 is a lovely introduction. It checks all the boxes: fruit, yes– pear and melon; floral, check– a hint of honeysuckle stopping short of blossomy sweet; mineral– double check.